THANK YOU for your desire to donate! 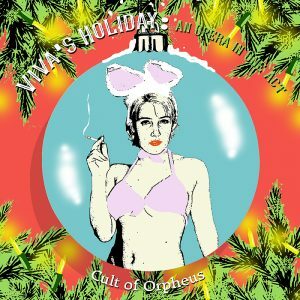 Your support will make a commercial recording of Viva’s Holiday: An Opera in One Act possible! If you are unfamiliar with our flagship opera and the accolades it has received, you can find out more on the Viva’s Holiday page. There are many ways you can support our recording! Our goal is to raise $15,000 to cover rehearsal and recording session costs; the project has a total expense budget of $24,500. Please pledge or donate today! Exclusive major business sponsorship is available at $5000 or higher. Our major sponsor’s logo and name are included on all printed and electronic materials. This tier includes passes to the concert and special events, acknowledgement in the physical record packaging (CD and vinyl), and other benefits. Please contact us today! Any size business donation is of course welcome as well! We will include you in our list of sponsors and social media posts. In-kind donations are also welcome to support our fundraising efforts – just send us a note to get in touch about your product or service, or donate online. Advertising in our printed program will connect your business with our fans and help us cover costs of printing the program. Ad buys also include sharing on our social media channels. Please contact us for rates, guidelines, and deadlines. We welcome sponsors of our singers and performers, from individuals or businesses. Your name will appear alongside the performer’s credit in the program and on our website, and you will be invited to special events and rehearsals. Each performer has a different sponsorship level based on their total hours of rehearsal and recording, in the range of $500 to $1300. Section sponsorships for our chamber orchestra are also available! Contact us today to discuss sponsoring a performer. Please send us a message on the production expense you’d like to sponsor, and make a donation online today. This project is sponsored by Fractured Atlas, a 501(c)3 organization, and your donation is tax-deductible to the extent permitted by law. You can also donate on our GoFundMe page for this project! Any donation is welcome. (Note that GoFundMe donations are not tax-deductible).